Check out our pictures from filming a Sundance Ranch segment for Fox and Friends!! ​Learn about SUMMER HORSE CAMPS​ here!! Receive information on upcoming events, notifications of clinics and shows, and useful information about.........EVERYTHING HORSES! ​Sundance Horse Ranch is the largest horse ranch in the Houston area and offers ​​horse boarding, horseback riding lessons, horse training, summer horse camp, and the most scenic trail rides around! Boosting the largest turnout's for ALL of our horses!!! 150 acre's of turnouts with grass, ponds shade trees and much more!!! Horseback riders that board their horses at Sundance Ranch enjoy the natural beauty and serenity of our horse stables, trails and pastures. Feeding program of Purina high quality feeds and unlimited hay. Sundance horse ranch is not like any other equine facility you've seen. We are an actual working cattle ranch, offering over a hundred acres of relaxing, tree-lined, trail riding through the beautiful Texas landscape. ​Enjoy the tranquil atmosphere as you and your horse ride deep into the quiet woods, around the bayou, or take a break under the shade of the trees beside a gentle stream. Or for the more adventurous, challenge your horsemanship skills as you lope your horse in any of our five large, green, turn out pastures, cross one of the many ravines, or try dozens of different obstacles ranging from 3 types of bridges, a water box, log jumps, 8 gates, etc. 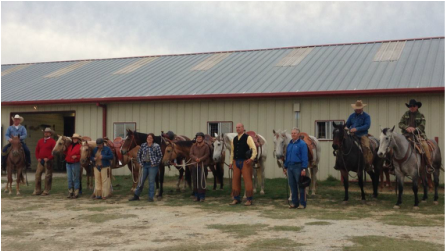 ​For the cowboys, we offer cattle sorting, penning, and roping lessons on our herd as well. Imagine your child telling their classmates that they herded cattle into a pasture for grazing!! Our newest addition 140 x 70.